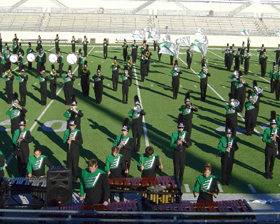 In addition to being one of the most visible organizations, open to all students on campus, the band records annually and releases a CD of highlights every two years. An integral component of any music education major's curriculum, the band provides ongoing opportunities for the development of leadership skills. The 300-member Green Brigade is a powerful contributor to the growth of the future band conductor and embodies the spirit and pride of the University of North Texas.